If you saw a diverse group of high school students waiting at the airport eagerly holding up signs, barely able to contain their excitement, the last thing you would expect is that they are part of a Chinese exchange student program. But on that particular Sunday afternoon, the host students indeed attracted a great deal of attention with their enthusiasm and vivacity. Students at our school were hosting students from both China and Argentina; the cultural exchange proved very enriching, bringing together American, Argentinian, and Chinese students, a rare occurrence. In a society that often tends to stereotype people based on their race (among other things), this program really pushed interaction to overcome this sort of ignorance. Our school community embraced their arrival with open-mindedness and made them feel unconditionally welcome in our hallways. Our exchange student was a fifteen-year-old named Lacey. Her English as a freshman was more advanced than my Spanish was as a senior. Even though I had taken Chinese language classes for the majority of my life, I had lost much of my ability to read and write the language, and my speaking had also decayed somewhat, as I did not speak it often. But Lacey’s presence really reinforced what I could remember, as I wanted to do more than force her to communicate with us entirely in English. I wanted to meet her halfway and get something out of her visit, so often I engaged her in Chinese. My parents, native Chinese folks, still spoke a lot of Chinese to her even though she was supposed to be perfecting her English. After dinner, we would frequently sit around the table together conversing in Chinglish, a unique and arbitrary mix of the two languages. Looking back, I realized that our family did not have to go to great lengths to show her what our unique Asian-American fusion culture was like; it could be as simple as taking her to the park on a Saturday afternoon with a loaf of bread and introducing her to the ducks, giving her a feel for the warm weather that Atlanta could allow. It could be as simple as taking her on a walk around the neighborhood, pointing out all of my favorite places to venture. During the great Snowpocalpyse, we invited our neighbor over and played Just Dance and board games, which she picked up very quickly. But sometimes, we decided to be a little bit more extravagant. We took her to fancy restaurants and ordered all of the best dishes, especially the night before her departure. On the weekend, Vicky took her to meet with all of the other host students with their exchange students to go watch a movie, which did not require much English to comprehend. Lacey’s friends giggled at our different cultures and huddled together at school, but going to different homes at night definitely pushed them to interact with their host students more. As a senior in high school, I expected the age difference to be very obvious in our daily interactions, but the issue did not come up much. I would give her my input and opinion on college, friendships, and the like; what I told her, I thought, was relevant regardless of where we came from, regardless of how old we both were. As many of the host students were older than fifteen years old, I found that the age difference was negligible, as everyone found ways to relate and connect regardless of the differences in maturity. On some days, the students went with their host students to shadow classes for a few periods; I had my sister take on that responsibility because they were the same age. I figured that the coursework might be more similar and easier to comprehend. Lacey sat in on physics classes, math classes, and the like; these subjects do not require an expansive knowledge of the English language for excellence. The students were scheduled to go tour the Coca-Cola factory, and I was signed up to go, but the Snowpocalypse that hit our city full-force and left us reeling also forced the school to cancel the trip and postpone their flight back to China. Thus, we had two days or so of free time confined to our house. Just as Atlanta could be sixty degrees one week, it could very easily be twenty degrees the next. We utilized this free time very well, playing around and taking pictures in the snow. 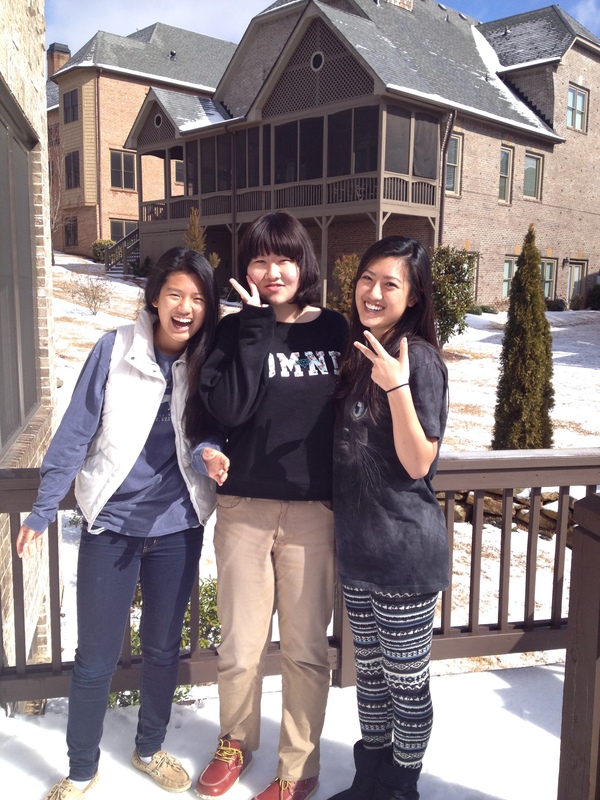 Despite my initial doubt about hosting an exchange student, I am so glad that I decided to do so. Over two weeks that the students were being hosted in our houses, their presence created a basis for lots of friendships to grow. Academic exchanges are really something phenomenal, as most high school kids don’t have this experience. In a world where wars rage on and international politics is as tense as it is, it is comforting that the youth can still find strong ways to relate and connect with one another. The world stretches farther than your zipcode; there are people on the other side of the world just like you.